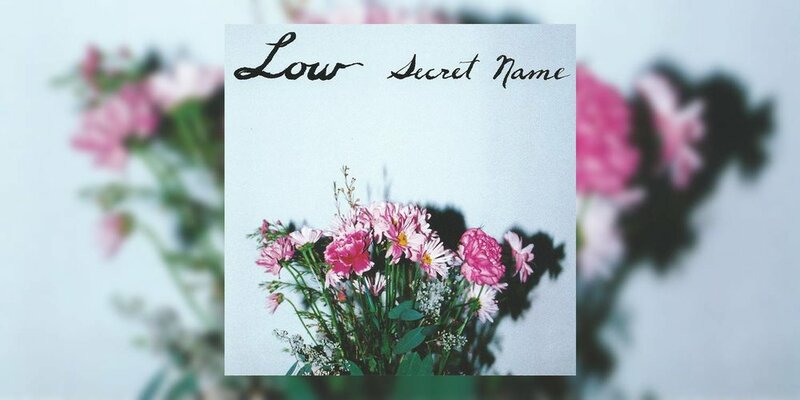 Happy 20th Anniversary to Low’s fourth studio album Secret Name, originally released March 30, 1999. No matter what some might tell you, Secret Name isn’t just another slow, pretty Low record in the vein of its precursors. With more orchestral, full and structured songs, Low’s fourth long-play album is that embrace of a dance you never want to end—epitomizing the mastery of a no-longer-nascent band in luminous charge. Mission achieved. For its fifty-two minutes, Secret Name ensconces you, emitting just the right mix of the drone-y minimalism of earlier albums and the louder, more lush aesthetic that followed. With their sparse poetry, symbolic imagery and quiet mesmerism, tracks like “I Remember,” the somnambulist shuffle of an opener, and “Two-Step,” the album’s third track, dwell in the realm of early ‘90s Low. These songs quickly remind us that the transcendent harmonies of Low assume many forms. “Two-Step,” for example, instantly brightens in the way so many Low songs do, with the sublime voices of Alan and wife Mimi Parker seamlessly uniting. Meanwhile, in “I Remember,” the barely-there vocals take a back seat to a hypnotic blend of Mimi’s soft, steady drumming, Alan’s simmering guitar and bassist Zak Sally’s hissing keys. Twenty years after the release of Secret Name, I can’t help but pause on the name “I Remember” itself. When I recall my first experiences with the album, I think of sitting on the floor of a carpeted Santa Monica room listening with another Low fan who would become my first serious boyfriend. The memory is somehow both reassuring and disconcertingly distant. The lyrics of “I Remember” (“I remember every number / I remember every graduation / I remember painted faces / No, they couldn’t believe it was you / I knew”) seem to capture the duality of living in these two worlds—yesterday and today. Our past is our own lost secret. It may seem vivid, conjuring specific images and feelings, but it forever eludes us. Jolting us back from the solitary edge is the unexpectedly jangly “Starfire.” As the album’s second track, it immediately snaps us out of the existential tailspin with gleeful singalong grandeur. Inspired by a pirate radio DJ, the three-minute gem approximates lighthearted pop in a way atypical of Low. “Immune,” the album’s sunny eighth track veers into similar territory, but it’s less euphoric. Part of the magic of Secret Name—and most of Low’s repertoire, for that matter—is it manages to offer utmost beauty and comfort despite the psychological and spiritual demons it faces. From the very first song, we encounter painted faces and the pitting of belief versus truth. As the album progresses, a heaviness descends. Many songs make reference to burden and brokenness. And through it all, there’s a palpable desperation for all manner of sanctuary—not the least of which are self-knowing and a place that feels like home. But, rather than being dogmatic, Low’s lyrics come across as exploratory and inquisitive. It’s one key reason Low’s music resonates—the words may be opaque, but the search for answers is universal. These feelings of isolation often carry with them conflict and despair. Nowhere is this more evident than “Don’t Understand,” the darkest, most pensive track that sits at the core of the album. A self-waged war of sorts, the song begins with nearly two minutes of glitchy looping static before cymbals crash in and the drums—and psyche—start pounding. Defiant and raw, Alan wails “I don’t understand” repeatedly, every utterance a plea. In the course of doing so, he reaches a turning point, which seems closer to acquiescence than epiphany, before retreating into the whirring static. With the cyclone losing power, Low bestow us with the stunning melody “Soon.” The somewhat unnerving lyrics (“Soon it will be over / I laughed under my breath over your shoulder / You think that I don't know your name / And now your face is all in flames”) contrast with its initial fragility, eventually giving way to lush strings. I will always profoundly appreciate and treasure the earliest works of Low, but the bigger sound —rich with violin, viola, cello and piano—also suits them quite well. A prime example is “Will the Night,” my favorite song of the album (not to mention one of my favorite Low songs of all time). First released on the Songs for a Dead Pilot EP (1997), “Will the Night” was already swooning perfection. Its dreamy ambiance and ethereal vocals transport me to the exact moment of supernova. But, if the original is hushed and airy, the version on Secret Name is bold and majestic. It’s one of those intensely romantic songs that stops all time. I actually love it so much, my heart can’t bear hearing it too often (I know that sounds crazy, but don’t judge til you’ve given it a listen). People often ask me where’s the best place to start with Low, and I usually recommend I Could Live in Hope, their first album. After all, it’s a logical way to note their progression. But, penning this tribute has made me realize Secret Name is where you should begin. The Duluth-based band have been consistently amazing since day one, but Secret Name is a welcome reminder that the most enduring artists stay true to themselves however they may grow.